Spinach in a classic sesame sauce made with mild white sesame. Simply defrost in the refrigerator, or beneath running water, and enjoy. 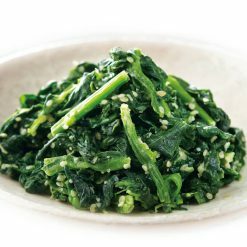 This item features organic spinach, which is carefully seasoned before it is combined with a specially-made sauce made of roasted and ground sesame. This item contains lots of calcium and iron. In addition, spinach is packed with vitamins K and A, and also contains manganese, folate, and magnesium! 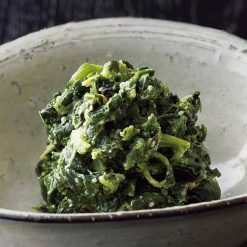 Our spinach with sesame sauce is a delicious way to get kids (or adults) to eat their greens. Because it comes frozen and needs only to be defrosted, it is easy to prepare at any time; with no worrying about keeping fresh spinach from wilting or going bad. Many other ordinary versions of this item are seasoned with chemical seasonings, and in some cases the ingredients are not seasoned before being paired with their sauce. The latter results in an underlying blandness in the dish. In Sugarlady’s version, the spinach itself contributes to the overall flavor of the dish rather than simply being a vehicle for the sauce! Defrost in the refrigerator, or by placing the entire bag beneath running water, and enjoy.This item makes a great appetizer or side dish, and can also be mixed with rice or noodles as part of a main course. It can even be used as an ingredient in various kinds of sushi! 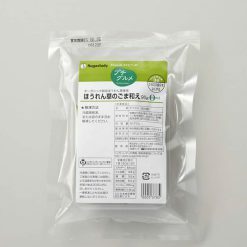 This product contains organic spinach (China), sesame, soy sauce (contains wheat), hon-mirin, sugar, flavor (katsuobushi, kombu seaweed).. Origin of ingredients: spinach (China), sesame (Guatemala, Paraguay, other). Prepared and packaged in Japan.